Ht / Wt: 6'4" / 211 lb. A.J. 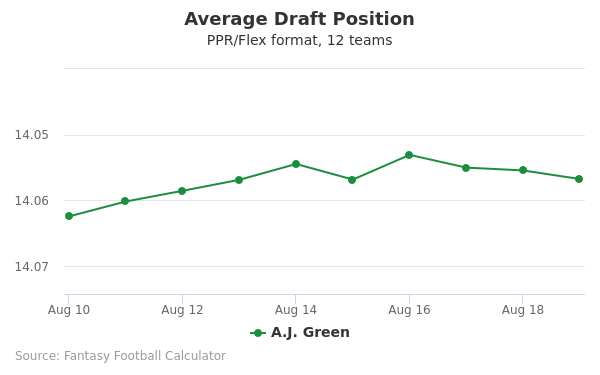 Green's fantasy value is measured by his average draft position (ADP) in fantasy football mock drafts. 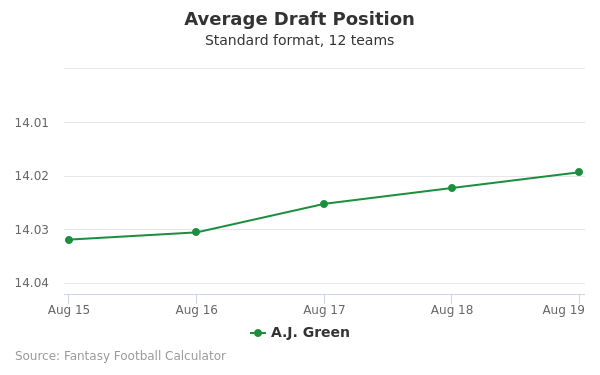 In recent drafts, Green's current ADP is 3.06, which indicates that his fantasy outlook is to be the 6th pick of the 3rd round, and 30th selection overall. The code below will display a graph that updates every day to show the ADP data for A.J. 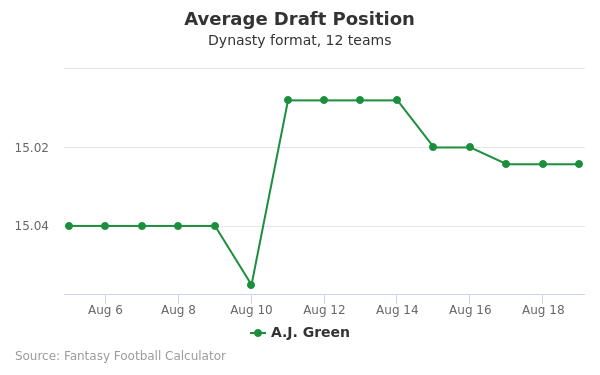 Green for the past 30 days in 12-team PPR leagues. Draft A.J. Green or Keenan Allen? Draft A.J. Green or George Kittle? Draft A.J. Green or Mark Ingram? Draft A.J. Green or Aaron Jones? Draft A.J. Green or Amari Cooper? Draft A.J. Green or Phillip Lindsay? Draft A.J. Green or Derrick Henry? Draft A.J. Green or Stefon Diggs? Draft A.J. Green or Aaron Rodgers? Draft A.J. Green or Devonta Freeman? Draft A.J. Green or Chris Carson? Draft A.J. Green or Brandin Cooks? Draft A.J. Green or Derrius Guice? Draft A.J. Green or Andrew Luck? Draft A.J. Green or Kenny Golladay? Draft A.J. Green or Kerryon Johnson? Draft A.J. Green or Cooper Kupp? Draft A.J. Green or Eric Ebron? Draft A.J. Green or Robert Woods? Draft A.J. Green or Julian Edelman? Draft A.J. Green or Tarik Cohen? Draft A.J. Green or Baker Mayfield? Draft A.J. Green or Jarvis Landry? Draft A.J. Green or Alshon Jeffery? Draft A.J. Green or O.J. Howard? Start A.J. Green or Keenan Allen? Start A.J. Green or George Kittle? Start A.J. Green or Mark Ingram? Start A.J. Green or Aaron Jones? Start A.J. Green or Amari Cooper? Start A.J. Green or Phillip Lindsay? Start A.J. Green or Derrick Henry? Start A.J. Green or Stefon Diggs? Start A.J. Green or Aaron Rodgers? Start A.J. Green or Devonta Freeman? Start A.J. Green or Chris Carson? Start A.J. Green or Brandin Cooks? Start A.J. Green or Derrius Guice? Start A.J. Green or Andrew Luck? Start A.J. Green or Kenny Golladay? Start A.J. Green or Kerryon Johnson? Start A.J. Green or Cooper Kupp? Start A.J. Green or Eric Ebron? Start A.J. Green or Robert Woods? Start A.J. Green or Julian Edelman? Start A.J. Green or Tarik Cohen? Start A.J. Green or Baker Mayfield? Start A.J. Green or Jarvis Landry? Start A.J. Green or Alshon Jeffery? Start A.J. Green or O.J. Howard? A.J. Green was born as Adriel Jeremiah Green on July 31, 1988 in Summerville, South Carolina. Growing up, Green enjoyed playing several sports like basketball, track & field, and, of course, football. During his high school career at Summerville High School, he played wide receiver, under the coaching of John McKissick, which was when he truly discovered his love for football. In June of 2006, Green was profiled by Sports Illustrated as a part of their feature “Where Will They Be?” stories that discussed the futures of ambitious young athletes, like Green himself. As a sophomore with 75 receptions for 1,422 yards and 16 touchdowns, Rivals.com selected him as a member of their Junior All-American team. In 2008, Green signed with the University of Georgia, where he played wide receiver from 2008-2010. His college highlights video is available online. Some of his awards he received during his college career were the Freshman of the Year award by the SEC coaches. He was also included in the All-SEC First Team. Green ended his three seasons at the University of Georgia with 166 receptions for 2,619 yards and 23 touchdowns. In the 2011 Scouting Combine, Green ran an impressive 4.50 second 40 time, and jumped a 34.5 inch vertical jump.You can see his whole profile from the combine on the NFL Draft website. During the NFL Draft, Green was selected 4th overall (1st round, 4th pick) by the Cincinnati Bengals, and then signed a four-year contract worth $19.6 million. After signing with Cincinnati, he became a member of the School of Legends in 2011. This was just the beginning of his success as a rookie. In Week 3 of the 2015 season, in a game against the Baltimore Ravens, Green caught 10 passes for 227 yards, which best his personal career record and was made the second highest single game total in franchise history. He finished the season with 86 receptions for 1,297 yards and 10 touchdowns. Green had a great start to his season, having 180 receiving yards and 54 yard touchdown during their win against the Miami Dolphins. Unfortunately, on the week 11 game against the Buffalo Bills, he tore his hamstring, which resulted with being placed on injured reserve for the next five games. He finished the season with 66 receptions, 964 receiving yards, and 4 touchdown receptions. Due to the lack of game he played in, this year marked his first NFL season without running over 1,000 receiving yards. But regardless of his injuries, the games he did play had some great highlight moments. You can check out his highlights video on Youtube. Growing up in Summerville, South Carolina, Green’s father worked as a steelworker and a truck driver while his mother worked as a clerk at a Walmart. Tragedy struck his family when he was 4 years old, when his older brother Avionce died in a car crash that also left his aunt paralyzed. As AJ grew up, he learned how to juggle and was a member of his elementary school’s juggling team. Most people believe that his juggling skills allowed him to have the great hand-eye coordination he has today. Today, Green is married to Miranda Brooke, his longtime girlfriend and aspiring singer, and is the father of Easton Ace Green, who was born on September 21, 2016. Currently, A.J. is signed on a 4-year $60 million contract with the Cincinnati Bengals, including a $15 million signing bonus. His average annual salary is $15 million as well. You can find Green on twitter and instagram at @ajgreen_18 where you can keep up to date on his personal life. 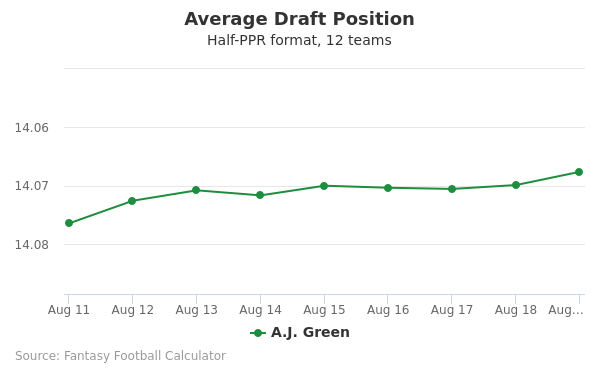 Green wears number 18 for the Cincinnati Bengals, and is the third-ranked Madden 2017 Wide Receiver based on his overall rating score of 93, which also puts him in the top 10% of all NFL Wide Receivers.